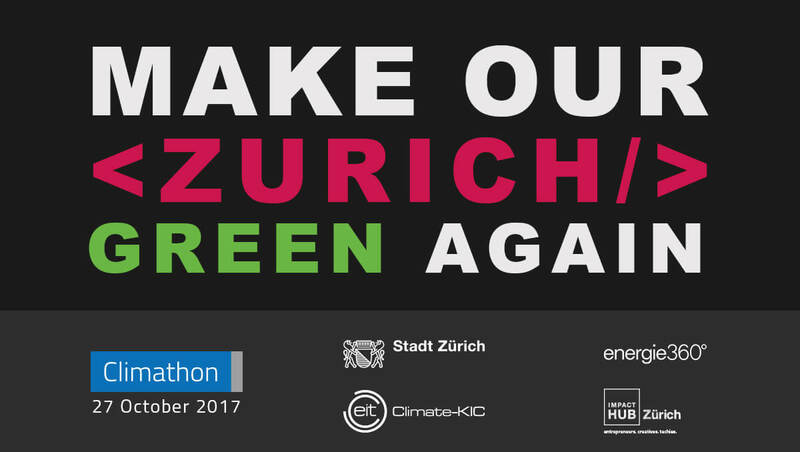 Become a climate hacker and join the 24-hour #Climathon in Zurich on 27 October 2017! Solve the climate challenges put forward by the City of Zurich and Energie 360° in the spheres of food, e-mobility, energy and climate change adaptation. Join the #Climathon Zurich as a developer, entrepreneur, technical expert or student with an existing idea, or simply to work on a new solution surrounded by an inspiring team. Experts and mentors will support you in finding the best solutions to the multitude of climate challenges during the 24 hour period. A vibrant atmosphere, refreshments, inspirational talks and workshops, like-minded people, an area for rest, and a whole lot more await you at #Climathon in Zurich. For developers, students, technical experts or entrepreneurs with or without a precise idea, who want to create new solutions on the day of the Climathon. The best ideas will get the chance to enter the Climate-KIC Greenhouse to get accelerated towards success. For start-up teams who have already developed a product or service that can be adapted to one of the challenges. The best solutions will get the chance to be further developed with the support of the City of Zurich and Energie 360°.